The following is the family tree of the Spanish monarchs starting from Isabella of Castile and Ferdinand of Aragon till the present day. The former kingdoms of Aragon, Castile (see family tree) and Navarre (see family tree) were independent kingdoms that unified in the 15th century to become the Kingdom of Spain. Salas Merino, Vicente (2008). La Genealogía de Los Reyes de España [The Genealogy of the Kings of Spain] (in Spanish) (4th ed.). Madrid: Editorial Visión Libros. ISBN 978-84-9821-767-4. "The Royal Family Tree". Official website of the Royal Household of Spain. Retrieved 2010-09-14. José Rodolfo Díaz Lussnigg. "Family Tree of Spanish Monarchs (718–1469)" (SWF) (in Spanish). www.reyesdeespaña.com. Retrieved 2010-09-14. José Rodolfo Díaz Lussnigg. 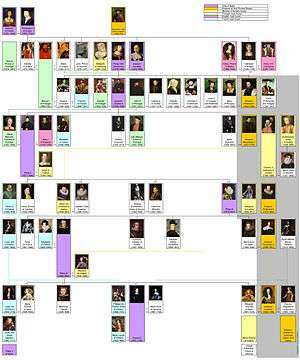 "Family Tree of Spanish Monarchs (1469–2010)" (SWF) (in Spanish). www.reyesdeespaña.com. Retrieved 2010-09-14. José Rodolfo Díaz Lussnigg. "Family Tree of the Spanish House of Bourbon" (SWF) (in Spanish). www.reyesdeespaña.com. Retrieved 2010-09-14.